In January I attended a photo workshop presented by John Reed in conjunction with the Okefenokee National Wildlife Refuge. The noted preserve was established in 1936 to protect the unique freshwater ecosystem and head waters of the Suwannee River. I’d never been through the Florida/Georgia swamp even though it sits just 75 miles away. The park is vast, listed at 402,000 acres or roughly the size of 300,000 football fields. Whoa! The strange name comes from Native Americans who called it Okefenoka, meaning “Land of the Trembling Earth.” The name is still appropriate as peat continues to build up on the swamp floor and the deposits are so unstable that trees and bushes tremble when you stomp the ground. 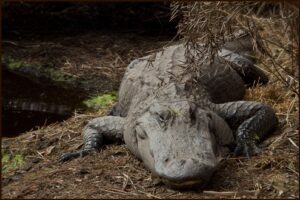 During the workshop lunch break, I spotted an alligator sunning himself near the Visitor’s Center. His skin looked gray and dry and I suspected he’d been there quite a while. One of the rangers mentioned that gators move slowly during the winter. Since I’d seen frost on the morning drive and the temperature hovered around 38-40 degrees at noon, I wasn’t too worried. I got down on my belly atop a raised boardwalk and snapped this photo. Later in the afternoon, I returned and noticed a second, smaller gator. The larger one had only moved about a foot from his previous location and both barely opened their eyes. Guess most of the creatures were sleepy because my group had only seen these two reptiles and a slew of birds all day. A sunrise shoot was planned for the next morning and the weather stayed cold. Sadly, the sunrise didn’t opt to make a dramatic entrance, so the group decided to move along. We headed in the direction of a fantastic winding boardwalk and three-story viewing platform. But, as photographers are apt to do; we stopped after noticing some interesting tall grass. Instructor John walked along the road surveying the landscape. I was not far behind when we heard a hissing sound, like an amplified snake. John caught site of a gator’s head rising from a small mud-puddle. I wanted to photograph this wild critter, so I ran over. Sure enough, the small head was all I could see, surrounded in a thick mud bath. Was his body buried deep below? Perhaps foolish thinking, but I stepped closer. That gator wouldn’t or better yet, couldn’t move quickly from his location, could he? Nah. Just as I was getting ready to click the camera, he hissed at me- VERY LOUDLY. That’s a sound I”ll never forget. I jumped back and my resulting shot is a bit blurry, but you can see his open mouth. Mr. Gator was mad and I was scared. 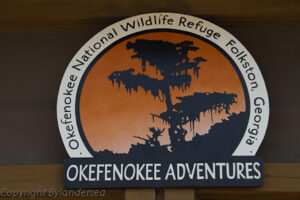 As far as I was concerned everything was not okey-dockey in the Okefenokee. I immediately departed the scene, leaving the fellow alone. Even if I didn’t get the photo, I at least left with a gator tale.